The role of urban agriculture (UA) for the supply of fresh vegetables, fruits and meat for local markets is well known. The periodically flooded Gerif soils on the River Nile banks in the core of Khartoum city harbour vegetable gardens that supply perishable leafy vegetables with a short life cycle. 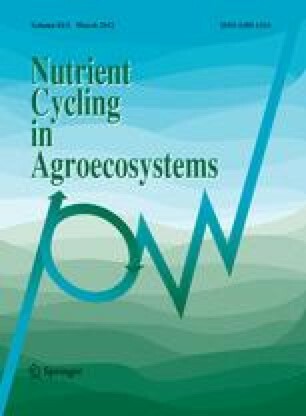 In an effort to assess their sustainability and possible negative environmental impact we used a horizontal balance approach to determine the nutrient use efficiency of four intensively cropped UA gardens. Two of the gardens were located in downstream lowlands (L1 and L2) and the other two belonged to the upstream highlands (H1 and H2). The river sediments contributed on average 873 kg nitrogen (N), 6.5 kg phosphorus (P), 6.8 kg potassium (K) and 8,317 kg carbon (C) per hectare in lowland gardens, while only 289, 1.6, 2.5 and 1,938 kg N, P, K and C ha−1 reached the highlands. The farmers’ management in all four gardens resulted in horizontal N and C surpluses of 75–342 kg N ha−1 year−1 and 798–6,412 kg C ha−1 year−1, in contrast to P and K for which negative balances up to −45 kg P ha−1 year−1 and −583 kg K ha−1 year−1 were recorded. While the River Nile floods as important N and C source contribute significantly to soil fertility maintenance, the negative P and K balances call for a better integration of UA gardening with livestock husbandry and the regular addition of animal manure in these cropping systems. The authors are grateful for the cooperation with the gardeners of the Gerif vegetable gardens in Khartoum and for funding of this study through an Alexander von Humboldt Research Partnership between the Agricultural Research Council (ARC, Wad Medani, Sudan) and the corresponding author’s institution.